I had meetings in Los Angeles last week and flew into LAX. I didn’t make arrangements to be picked up like I normally do, assuming that I’d order a ride from Uber when I landed. I was surprised and disappointed to discover that Uber cannot pick up passengers at LAX. So, I did the next best thing – stood in line for a cab. As I stood waiting a young brother approached me and asked if I needed a ride. He was neatly dressed in a black suit with a white shirt, armed with an Ipad and had an outwardly friendly disposition. I told him yes, I did need a car and gave him my destination. He plugged the address into his Ipad and quoted me a fair based on the 20 mile trip. Meanwhile the arrival area at Terminal 7 was absent of cabs and I was the sixth person waiting in an ever growing line. I thought to myself, why not give the young brother a try? I agreed to his terms. He grabbed my suitcase, explained that a client’s flight was an hour and a half delayed, led the way to his car and off we went. His Lincoln Town Car was immaculate and the complimentary bottle of water was a nice touch. The a/c was on full blast and the dulcet tones of Anita Baker provided the soundtrack for our ride. I spent the 1/2 hour car ride on my cell and ended my last call just as we pulled up to my destination. I thanked Taylor for getting me there so quickly. I am not in the habit of getting into unmarked cabs and I am certainly not the trusting type. This experience proved that you can never judge a book by its cover. It wasn’t Uber but it produced the same results. A young Black Entrepreneur focused on giving superior service. The right time. The right place. A chance encounter. 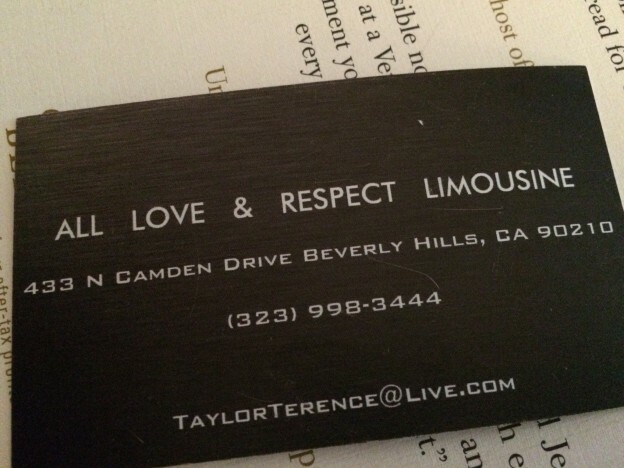 “Ghetto Uber” that demonstrated “all love and respect”…or a perfect scenario when “it” worked out? This entry was posted in Culture, Economy, Eric's Musings, Language and tagged African-American, economy, entrepreneurship, ghetto, love, Respect, Stereotypes, Uber on September 7, 2015 by Eric Roberts.